On the 11th of November Grahame Oliver and I are having a book launch for our new textbook “Dynamic Environments of Singapore”, which was published earlier this year. I’d like to invite you to attend – there will be copies available for purchase ($30 – bargain!). Please find the details on the FASS Environment Cluster blog. An event co-organized by the FASS Environment Cluster and the Singapore Research Nexus. Custom print for LSM1103 Biodiversity in the Science Co-cop! 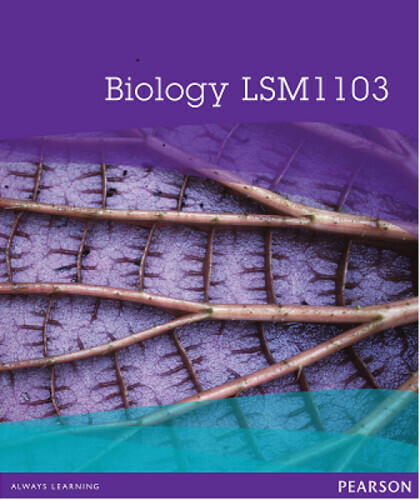 Students may use either Solomon, Berg & Martin’s Biology (9th Edition) or Reece et al.’s Campbell Biology (9th Edition) for LSM1103 Biodiversity. Since the module only requires Part V of these texts, we arranged with publishers for a lighter and cheaper bundle of the print copy of part V and the e-book. The book arrived early this week and I dropped in at the co-cop to take a look. Sure enough, they are right there at the entrance. 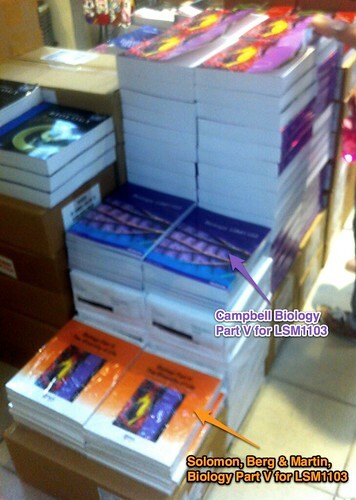 Campbell Biology, 9th Edition by Reece et al. The budge contains 1) a black and white print copy of Part V: The Diversity of Life & 2) a full-colour E-book of Part V (12-month validity). The final exam for LSM1103 is an open book exam. Students are allowed to bring textbooks and notes into the exam hall, but no electronic devices are allowed. “Yes, that “International Edition” can be used and sold in the US (says their Supreme Court),” by N. Sivasothi. Otteman speaks, 10 Jun 2013. 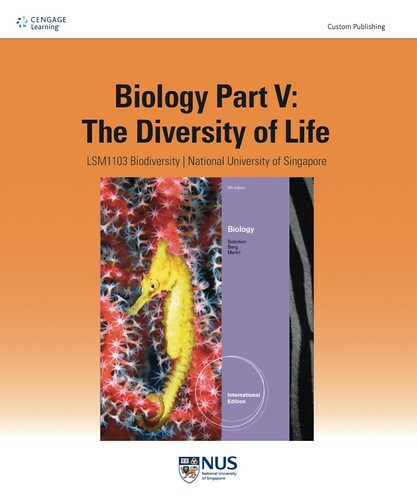 “Finally – custom print textbook + e-book bundle for LSM1103 Biodiversity!” By N. Sivasothi, NUS Biodiversity Crew, 30 Jul 2013. 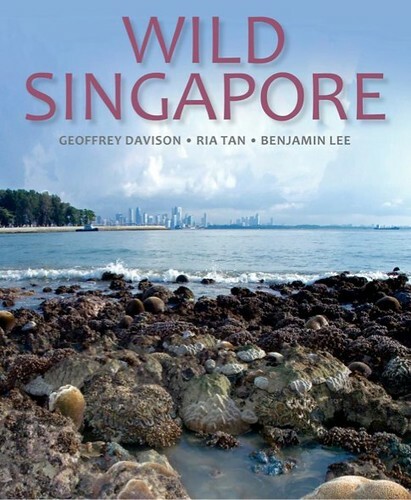 The long-awaited hard cover book, “Wild Singapore” By Geoffrey Davison, Ria Tan and Benjamin Lee will be launched in November and the price will be $69.90. The publisher, Pansing Distribution Pte Ltd, has agreed to extend a limited and super special offer of $40.00 to ALL students and staff of NUS at the first book sale for this publication! 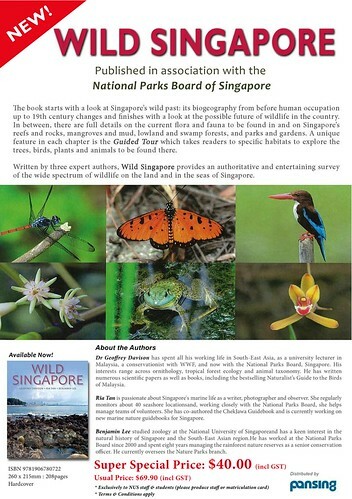 All NUS staff and students are welcome to come down and purchase the Wild Singapore book at these locations and times. Just show your matric/staff card to enjoy the super-special price! A new book, Decapod Crustacean Phylogenetics includes two chapters co-written by Peter Ng with contributions by many familiar friends of the Systematics & Ecology Lab. “Decapod crustaceans are of tremendous interest and importance evolutionarily, ecologically, and economically. There is no shortage of publications reflecting the wide variety of ideas and hypotheses concerning decapod phylogeny, but until recently, the world’s leading decapodologists had never assembled to elucidate and discuss relationships among the major decapod lineages and between decapods and other crustaceans. Based on the findings presented by an international group of scientists at a symposium supported by the Society for Integrative and Comparative Biology, The Crustacean Society, and several other societies, and with major funding from the National Science Foundation, Decapod Crustacean Phylogenetics provides a comprehensive synopsis of the current knowledge of this vast and important group of animals. This volume contains state-of-the-art reviews of literature and methodologies for elucidating decapod phylogeny. The contributions include studies on the fossil origin of decapods, morphological and molecular phylogenetic analyses, the evolution of mating and its bearing on phylogeny, decapod evo-devo studies, decapod spermiocladistics, and phylogenetic inference. The experts also present research on preliminary attempts to construct the first known phylogenetic tree for various groups of decapods. Several contributions offer the most comprehensive analyses to date on major clades of decapods, and others introduce data or approaches that could be used in the future to help resolve the phylogeny of the Decapoda. Richard’s new book is out (Publication date: 14 May 2009). Unfortunately it is an OUP book so is costly – US$61.23+ (paperpback) and US$126.07 on Amazon US, £28.45 (paperback) and £61.75 (hardback) on Amazon UK. Update: The Barnes & Noble price is cheaper – US$48.75. “We have just received stock of this important ecology book. Retail Price is S$55.00 inclusive of GST. 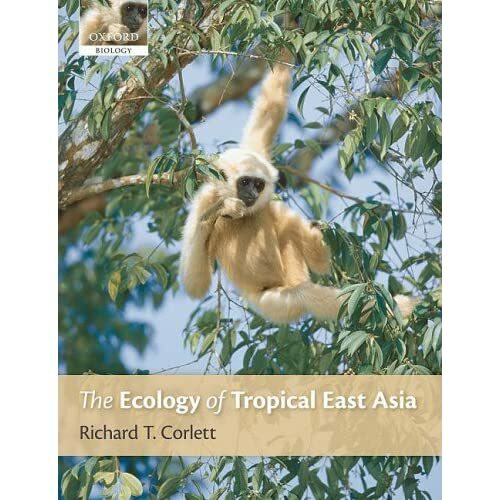 the first book to describe the terrestrial ecology of the entire East Asian tropics and subtropics, from southern China to western Indonesia. It deals with plants, animals, and the ecosystems they inhabit, as well as the diverse threats to their survival and the options for conservation. This book provides the background knowledge of the region’s ecology needed by both specialists and non-specialists to put their own work into a broader context. We are pleased to announce that the book “Diptera Diversity: Status, Challenges and Tools” has been published. Prof Meier is one of three editors of this hotly-anticipated book for all dipterists. This very attractive book not only comes complete with comprehensive information about Diptera biodiversity, it also includes gorgeous colour pictures and photos of flies, maps (and charts). It retails for €119/US$186 here. Some of us may remember Dr. Patrick Grootaert from the Royal Belgian Institute of Natural Sciences, a dolichopodid expert and regular collaborator with the NUS Biodiversity group. In this book, he authors a fascinating chapter on the diversity and taxonomic challenges of Oriental Diptera. He is currently here in Singapore to lay out the framework for the SMIP (Singapore Mangrove Insect Project) and to provide us with vast quantities of Belgian chocolate. Incidentally, Prof Meier also coauthors 2 chapters with our biodiversity alumni, Gaurav G. Vaidya and Guanyang Zhang, who is currently at UC Riverside completing his PhD on the systematics of reduviids (assassin bugs). Here’s a shoutout to the Heteropteran Systematics Lab @ UCR, current home of two ex-evolab denizens.